The Magellan Birdwing (Troides magellanus) is a large and striking Birdwing butterfly found in the Philippines and on Taiwan's Orchid Island. 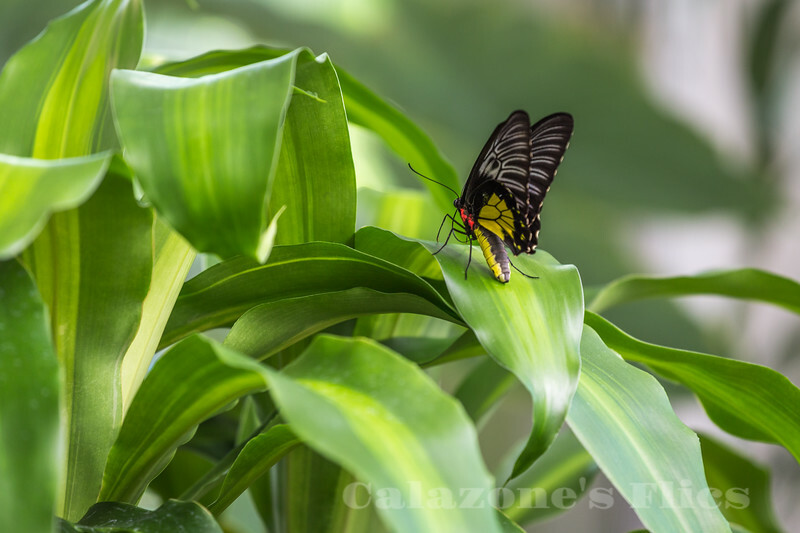 This butterfly is named for the explorer Ferdinand Magellan who was killed in the Philippines in 1521. Male: The fore wings are ground colour black. The veins are bordered by white colour.The underside of the forewings is very similar to the upperside, but some veins are bordered by yellow.The hind wings are golden yellow. The veins and the marginal edge of the hindwing are black. The golden area has an opal, green colour or blue colour at a certain angle. The underside of the hindwing is very similar to the upperside and also has the optical effect. The body (abdomen) is yellowish, but the underside is yellow. Head and thorax are black. Female: Troides magellanus is sexually dimorphic.The female is larger than the male. The ground colour of the female is dark-brown to black. The veins are bordered by white colour-shading. There is a golden area with dark veins on the hind wings. At the edge there is a postdiscal chain of golden spots.The underside is very similar to the upperside.